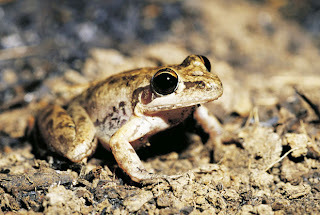 Animal Wildlife | Striped Rocket Frog | The striped rocket frog (Litoria nasuta) is a small species of rocket frog natively found on mainland Australia and on a number of the islands that are both close to it and surround it. 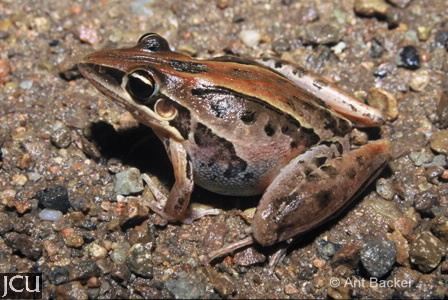 The striped rocket frog is closely related to other species of rocket frog, all of which are named for their remarkably agile jumping abilities and their streamlined-shaped bodies. The striped rocket frog is found mostly in coastal areas from northern Western Australia to New South Wales in the south and is also found inhabiting lowland areas of parts of the tropical Indonesian island of Papua New Guinea. 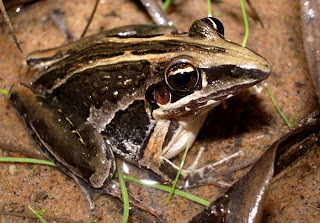 The striped rocket frog is found in a variety of wetland habitats including swamps, ponds and flooded grasslands in forests and open woodland. The striped rocket frog is an easily identifiable species of frog due to its relatively small size and the two stripe-like folds of skin the run vertically down the striped rocket frog's back. 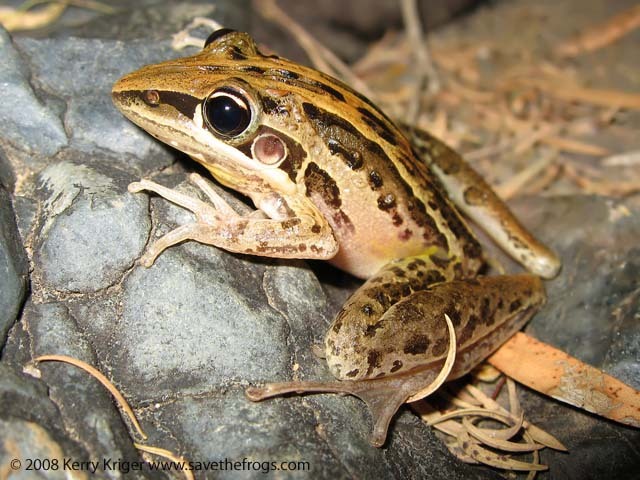 The skin of the striped rocket frog is usually a dark brown colour and has dark spot-like markings across it's back and legs. The striped rocket frog has a narrow and streamlined body which makes for more agile movement through both the air and water. The striped rocket frog has incredibly long and powerful legs which can propel this little frog over vast distances (comparable with it's size). The striped rocket is actually a type of tree frog but despite this, the striped rocket frog spends the majority of it's life on the ground due to the fact that they sticky discs on their toes are simply not big enough to allow them to climb with ease. Like most other species of frog, the striped rocket frog is a carnivorous animal that catches the majority of it's using it's long and sticky tongue. The striped rocket frog primarily feeds on small invertebrates such as insects, moths and spiders along with worms and insect larvae. 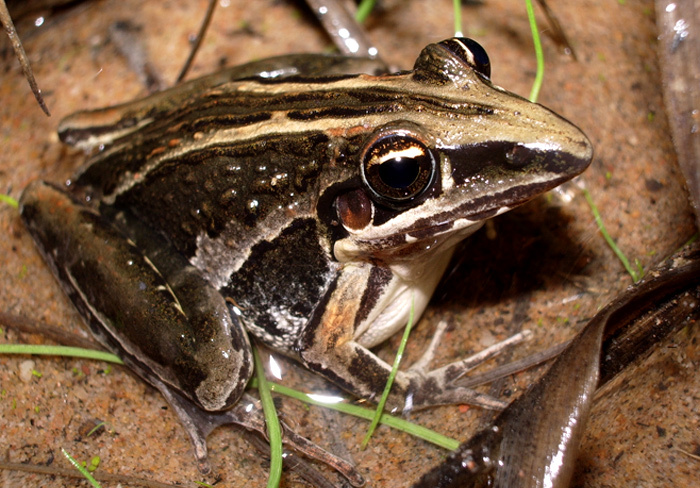 The webbed feet of the striped rocket frog mean that this animal is able to hunt effectively both on land and in the water. 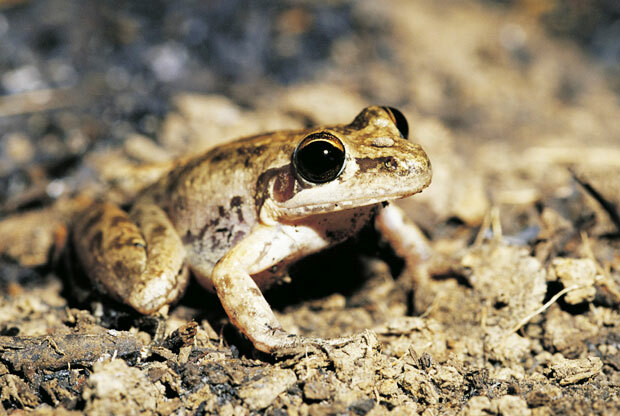 Due to the fairly small size of the striped rocket frog, it has numerous predators within its natural environment. 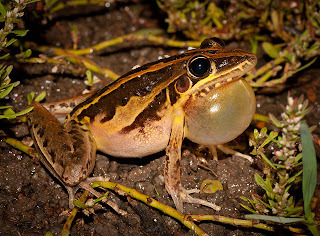 Large birds and bats prey on the striped rocket frog from the skies and ground-dwelling predators such as cats and foxes prey on this species on the ground. The water-based eggs and tadpoles of the striped rocket frog are preyed upon by aquatic animals including fish and other frogs. 0 Response to "Striped Rocket Frog"